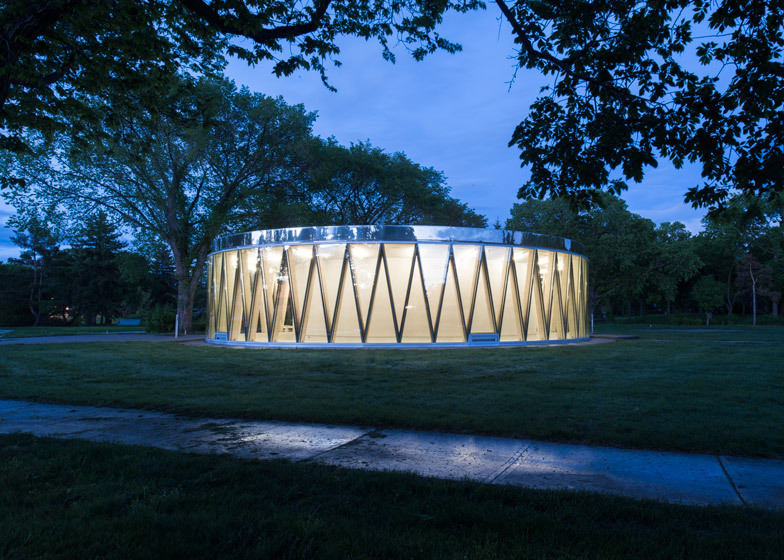 Borden Park Pavilion was designed by Toronto studio GH3 to accommodate public toilets and vending machines within its cylindrical core, while the gap between this core and the facade accommodates a small seating area. 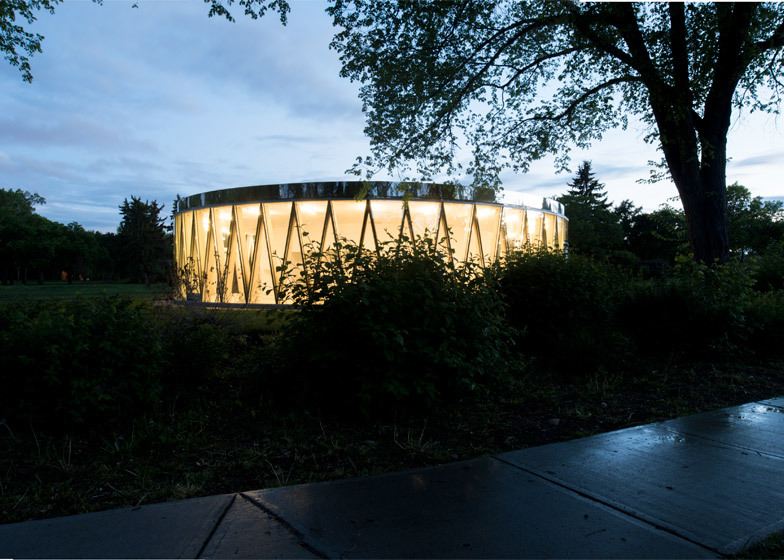 A truss framework made from laminated Douglas fir zigzags around the edge of the circular building, giving it the appearance of a drum. 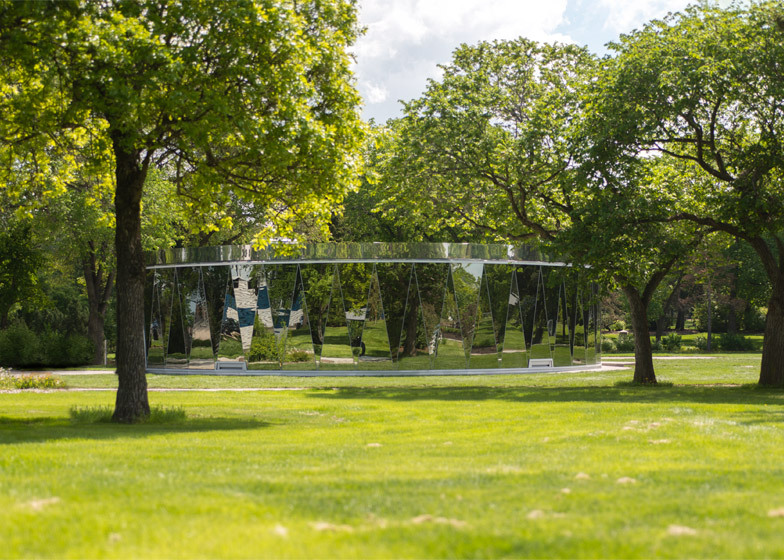 The architects said that the pavilion's circular shape was intended as a reference to a bandstand and carousel that previously occupied the site, as well as to the curving walkways that cuts through the park. 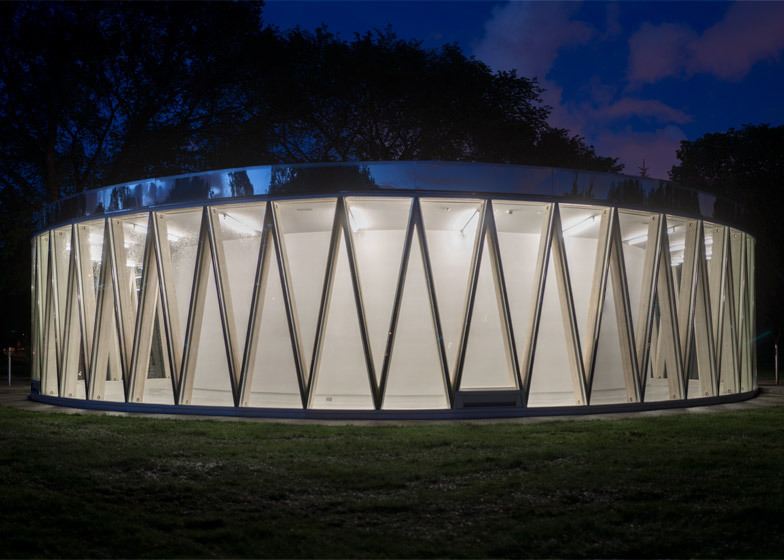 "The building recalls the iconic geometry of classical parks and pavilions, given the surrounding curving paths and loose axial relationships, typical of the traditional English school of landscaping," they said. 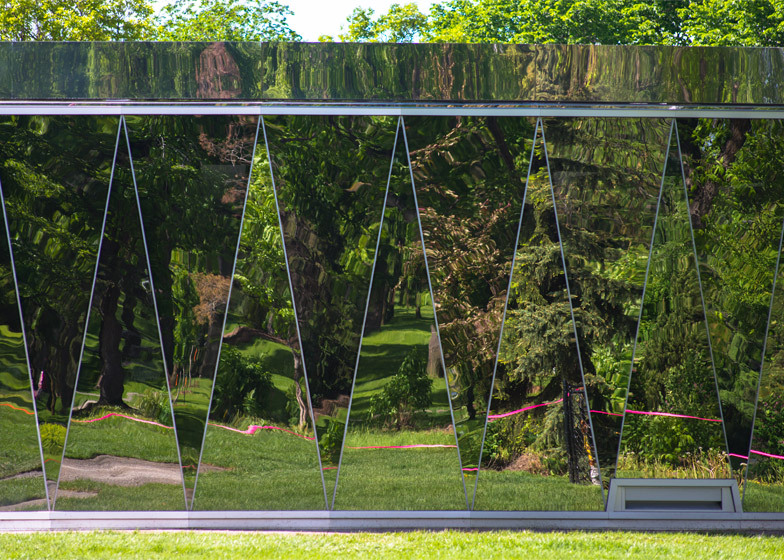 The truss framework is sheathed in a cladding of highly reflective glass panels that mirror the surroundings, helping to reduce the building's visual presence in the park during the day. 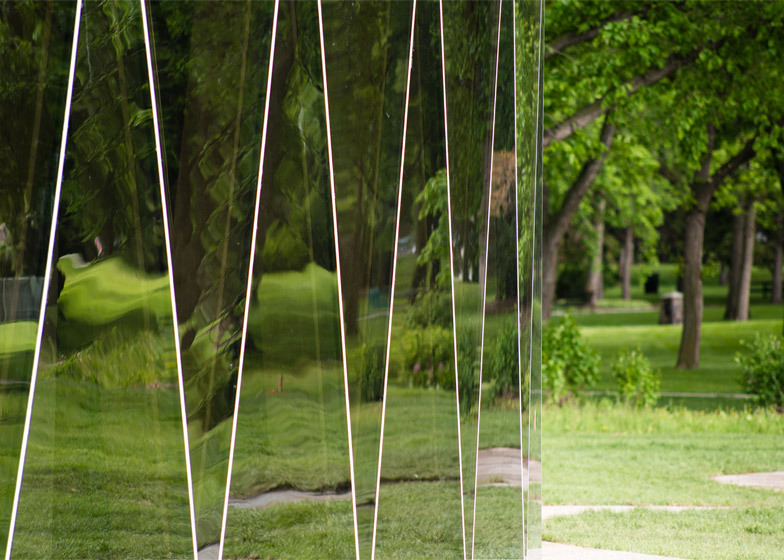 The arrangement of the flat triangular panels creates a faceted surface that produces distorted reflections. At night, when strip lights encircling the slightly off-centre core are switched on, the glass seems to disappear and the building's interior can be clearly seen from outside. 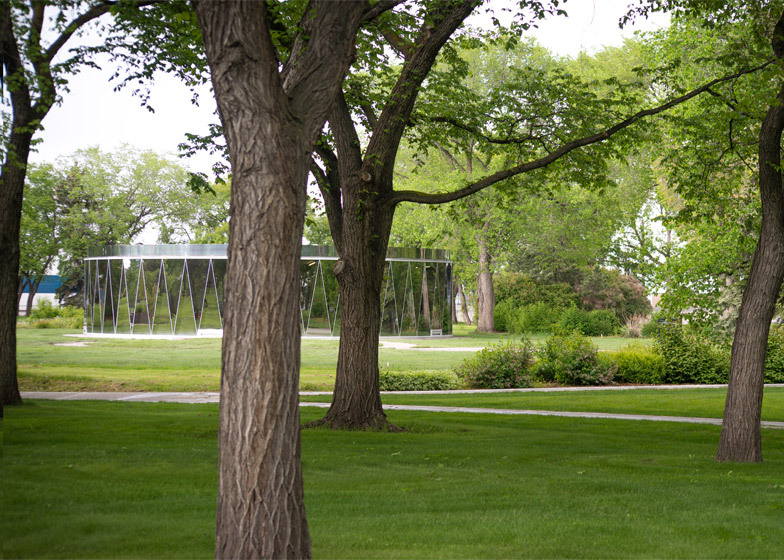 The architects chose to employ a simple material palette of glass, wood and concrete to ensure a robust building that evokes the park's previous and existing public architecture. "The structural ambition of the design emphasises the use of rough whitewashed laminated timbers, whose rich patina and spatial arrangement recall the iconic structures and materiality of the park's history while foregrounding the sustainable character of the building," they said. 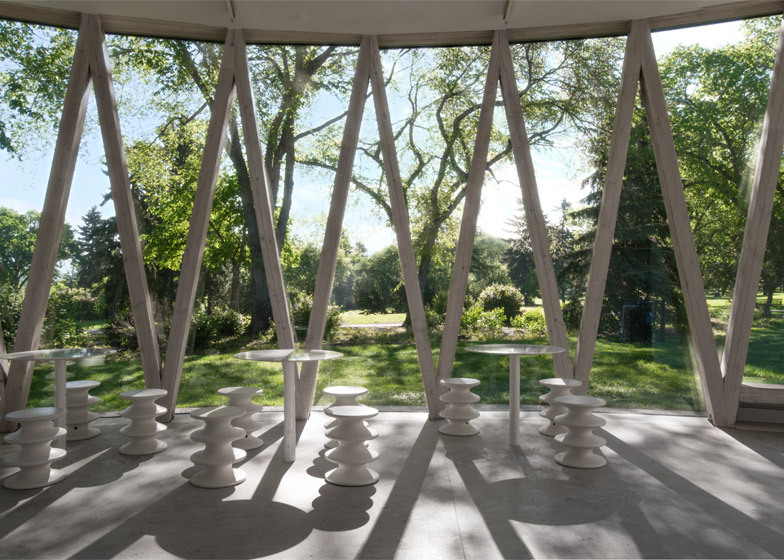 At the widest point of the open interior space, a group of tables embedded in the concrete floor provide a place to perch and look out across the park. Window benches built into the base of the framework are evenly spaced around the circumference to offer alternative places to relax and enjoy the scenery. Photography is by GH3's Raymond Chow.